An accomplished commercial artist and successful art director, Bruce Patrick Jones has always created paper dolls for the sheer fun of it. As a child in a small Jamaican town, young Bruce displayed an innate talent for drawing. One of his early inspirations was Bill Woggon’s Katy Keene comics and he soon was creating his own versions of glamorous characters with gorgeous wardrobes. His natural talent landed Bruce a job as an artist in an advertising agency right out of high school. After a few years, he left to attend the Ontario College of Art in Toronto, Canada and upon graduation, he returned to the advertising world. A dedicated traveler, Bruce often adds to his personal collection of paper dolls and movie memorabilia as he explores the flea markets in Rome, Barcelona, Helsinki, Paris, Buenos Aires and Rio. His chief interest is collecting paper dolls from magazines and newspapers. While continuing to have a flourishing career in commercial art, Bruce also gained a fan base of paper doll collectors when he created souvenirs for many of the regional and national organizations, conventions and clubs. His powerful style of skillful ink lines and flowing watercolor washes is instantly recognizable and his knowledge of anatomy, the result of continuing life drawing classes, is always apparent. 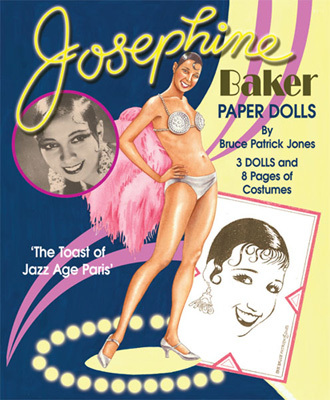 Over the years Bruce has created scores of paper dolls for magazines and convention souvenirs, and now his work has a wider distribution with two books for Dover Publishing: Action Stars Paper Dolls and Bettie Page Paper Dolls, as well as his books for Paper Studio Press.